A journey made in search of something or a long and difficult effort to do something are common definitions for a quest and that’s what this book is about. When I was asked to review this book I was intrigued because I couldn’t see how anybody could make an interesting story about a bunch of personal development experts. Boy was I wrong! I enjoyed reading this book because there was humor, a bit of mystery, and it was all framed up with a bit of interesting personal development psychology. 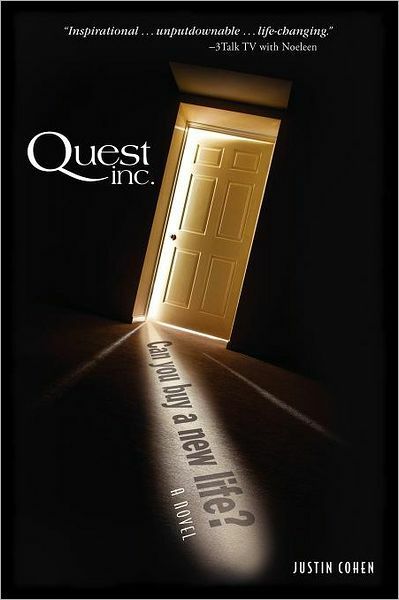 I can tell the book was written by someone who is a personal development expert because he goes through various concepts with the introduction of each new client at Quest, Inc. I learned some things and found the book uplifting. I also appreciated the mystery that runs through the story(will keep you reading) and that continues right to the end, which leaves us on a cliffhanger. Can’t wait to read what happens in book two. Although you know I’m not a fan of trilogies and series. I rate this book three and a half stars. I’d recommend it to anyone who is interested in reading a book with a twist and that’s out of the ordinary. Although I wouldn’t recommend it for those of you who don’t accept the philosophy of personal development coaches or life coaches. You may find it too preachy. It’s well worth the read though for its originality. So, check it out!!! Happy reading…..
Justin Cohen is the author of four books and seven audiobooks. He produced and hosted a television talk show in which he interviewed some of the world’s top experts on success. As a leading authority on personal development, with an honors degree in Psychology, Justin speaks, trains and writes in the fields of motivation, sales, service and leadership. Having spoken professionally for nearly fourteen years, Justin has presented in twelve different countries, and in virtually every industry, to an average of ten thousand people annually. Sounds quite interesting, you’re going to make me run up my book bill! I really appreciate your thorough review Didi.You’ve certainly captured what I’ve tried to achieve. You’re welcome! I hope it encourages others to pick it up. It really is interesting!